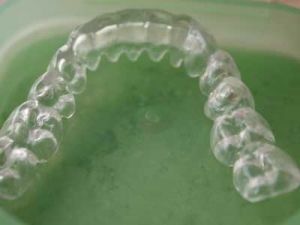 Custom designed nightguards and mouthguards are made of flexible plastic and molded to fit the shape of your teeth. Nightguards are recommended for patients who clench or grind their teeth at night as a way to protect their teeth and bite. Mouthguards are recommended to protect the jaw and teeth during physical activity and sports such as boxing, football, basketball, or other activities where your mouth may get hit. In addition, these guards protect the soft tissues of your tongue, lips and cheek lining. If you have decided a guard is right for you, the dentist will take an impression of your teeth which will then be sent to our lab to make a custom fit guard for you.